HPL slab end construction with 1 ½” decorative accents. 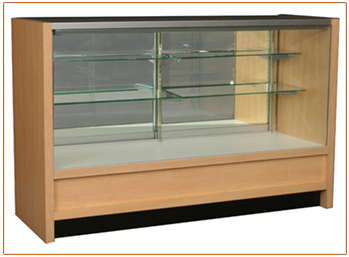 Showcases include frameless mirror doors. Glass display area is 26" high and 20" deep. Wood base is 8" high. Black kick base is 4" high. Overall height is 38". Complete with one row 8" and one row 10" deep shelving. Standard storage area is closed.